QR Tattoo is a temporary tattoo (if accepted, I can send up to 400 temporary tattoos and a display stand). Nicolas Bourriaud in his book Relational Aesthetics states, “the role of artworks is no longer to form imaginary and utopian realities, but to actually be ways of living and models of action within the existing real”. I believe that art can expand a viewer’s awareness of beauty and creativity and that this shifted awareness can empower individuals to think and act creatively within their lives and communities. 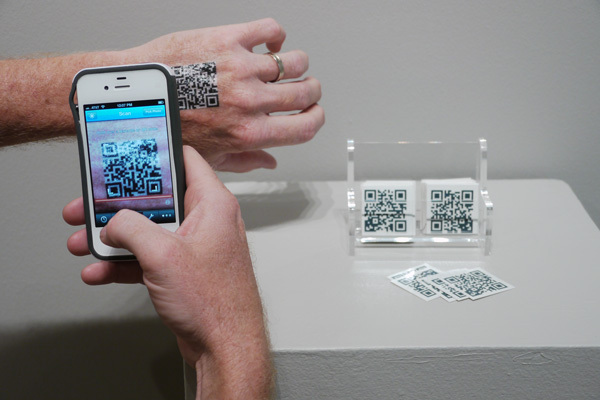 QR Tattoo asks the viewer to fully engage with the piece. By taking a tattoo, applying it, scanning it, and ideally, participating with the corresponding video, participants are asked to join in the creation of the work. Head and Shoulders, Knees and Toes from Peter Tucker on Vimeo. Peter Tucker teaches in the Visual Arts and New Media department at the State University of New York at Fredonia. He has a BA in Psychology from Oklahoma State University, a BFA from the University of Texas and an MFA from Massachusetts College of Art. Peter has exhibited nationally and internationally and has work in the permanent collections of the Blanton Museum of Art and the U.S. Library of Congress. His work, often based in Social Practice, is community based. He is interested in facilitating creative thought and action by artists and non-artists alike. Witness and Response: September 11 Acquisitions at the Library of Congress, Library of Congress, Washington, D.C.